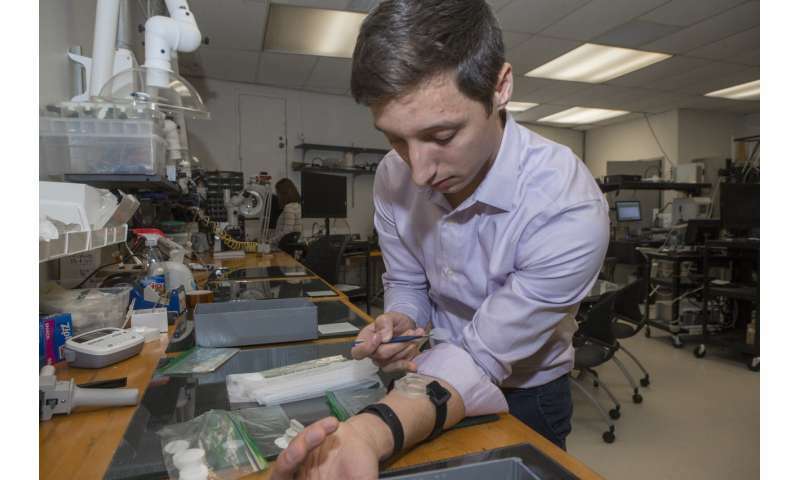 "You think of the skin as an opportunity because you can measure things through it optically, chemically, electrically and mechanically," said Jason Heikenfeld, assistant vice president in UC's College of Engineering and Applied Science. "But it's actually the opposite. The body has evolved to preserve all of these chemical analytes. So the skin actually isn't very good at giving them up." Heikenfeld, director of UC's Novel Devices Lab, co-authored a critical review of sensor research this month with his students and colleagues for the nanotechnology journal Lab on a Chip, outlining both scientific accomplishments to date and challenges ahead. 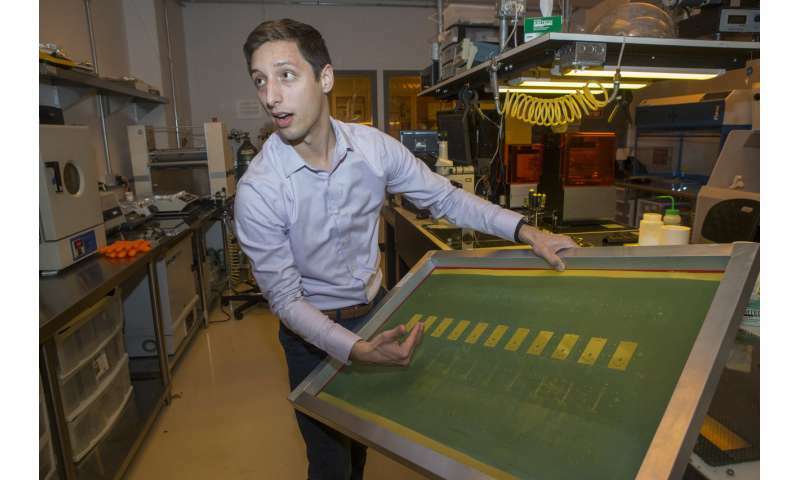 "We wanted to have all of the current progress and future directions and needs consolidated in one article," said Andrew Jajack, co-author and a UC engineering student. Jajack designed the image and graphic that appears on the journal's cover depicting the four ways that sensors can read biometrics in a track athlete. The skin can provide misleading data to biosensors since it harbors bacteria and tends to collect salt and other minerals from dried sweat. An effective sensor has to bend and stretch like human skin, even as it adheres to the surface when the subject is moving. Electrical sensors that track your heartbeat have to account for noise both from within the body or the environment such as from power lines or nearby electronics. "The latest trend has not been driven by technological breakthroughs," he said. "When you think of Fitbit, these capabilities have been around a long time. What's driven it is the proliferation of smartphones and miniaturization of electronics and a growing desire for health awareness." UC has a long history with biosensors. The late Leland Clark Jr., sometimes called "the father of biosensors," conducted research at the UC College of Medicine and Cincinnati Children's Hospital Research Foundation. Among his many feats, he developed the modern blood glucose monitor that diabetics use today and the first sensors to measure a patient's blood oxygen levels. "Sensors are a big deal here," Heikenfeld said. "It's something we've had historical strength in with pioneers in the field." UC's research in sensors continues to be a pipeline for industry. Heikenfeld is co-founder and chief science officer for Eccrine Systems Inc., a Cincinnati company that specializes in sweat biosensors. "We try to know other people's business better than they do. You can't innovate unless you are willing to dig way deeper than the competition," he said. Jajack said Eccrine Systems, Inc. is working on new ways to track biometric information continuously over time. "A lot of the way we diagnose disease is based on single-moment-in-time markers. But the promise of wearable sensors is real-time health monitoring," he said. "You can see a more complex picture of what's going on in the body. That alone will lead to more diagnostic techniques across a spectrum of diseases." Students in UC's Novel Devices Lab, located in the College of Engineering and Applied Science, are coming up with innovative ways to glean information from human sweat. These devices are the size of a Band-Aid and are worn on the skin like one, too. Students Adam Hauke and Phillip Simmers are working on UC's next generation of sweat-stimulating sensors. These devices generate sweat on a tiny patch of skin, even when the subject is resting and comfortable, and wick it away to sensors that measure substances like glucose. The biosensors collect and concentrate the faintest amounts of sweat into samples that sensors can read. "We'll stimulate sweating in this area and then this will start to pick up sweat off the skin, pulling it from the pores and moving it up across these electrodes here," Hauke said. "That's where we do the sensing." "The more you sweat, the wetter your skin is and the electrical resistance goes down," he said. "We want to concentrate the sample. So you can stick this on the front of your sensor and it does a lot of previously hard chemistry lab work for you," she said. "A big issue today is the amount of pharmaceuticals found in our drinking water," Jajack said. "They're hard to measure because they're so diluted. Even at diluted concentrations, they might be having an effect on us." Heikenfeld said his lab's success stems from its talented students, who apply their diverse interests and experiences to their lab work. Developing new sensors and applications takes problem solving that draws from many academic disciplines. "How often are you going to find someone who's deep into biology and chemistry who also does hack-athons and is a big maker, too?" Heikenfeld said of Jajack. "But that's what it's going to take. We need to innovate in disciplines that are not our traditional areas of expertise so we're not relying on others to move at speeds at which our own creative minds want to sprint. We're doing that now because of the quality of people we have here." 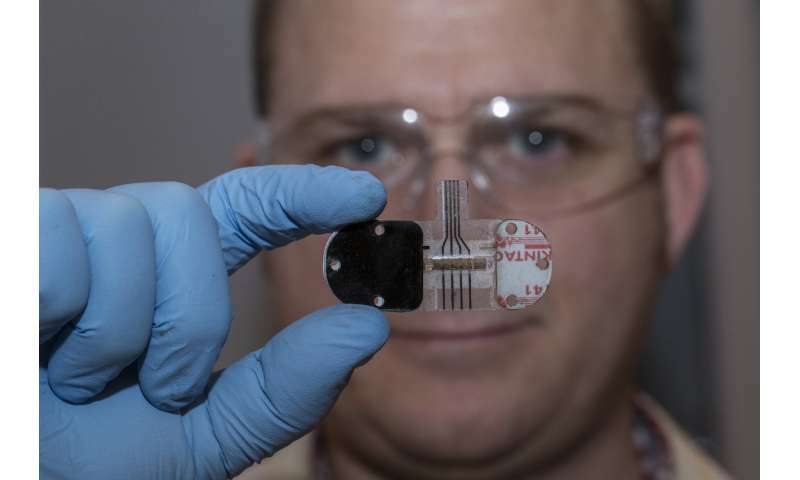 Moving sensor applications from the lab bench to the store shelf remains a big challenge, UC chemistry professor William Connick said. He serves as director of UC's Center for Biosensors & Chemical Sensors. "Groups like Dr. Heikenfeld's are making remarkable strides in developing technologies that provide information on biomarkers at exceedingly low levels from very small quantities of fluid like sweat," Connick said. "To go from the lab to a practical device is a challenge when you're working with real-world samples. Every person is a little different. Every circumstance is a little different," he said. "Making something that's robust enough to accurately perform under a wide variety of conditions is challenging." Connick said demand for biosensors is only going to grow as labs like UC's develop better ways to collect information. And home testing and continuous monitoring of drugs over time could lead to better health outcomes, he said. "The market is wide open now. The potential is gigantic, just in cost savings and being able to provide rapid screening without taking blood and having to send samples off to a laboratory," Connick said. Heikenfeld's journal article noted that biosensors of the future will measure multiple aspects of a person's physiology. And new wearable sensors will need a mix of disposable and reusable parts to address the wear and tear that come with daily life. Now UC's Novel Devices Lab is developing a new noninvasive technique to make sweat glands more permeable so sensors can record even more detailed data. Heikenfeld and Jajack are not ready to talk about how it works but they are very excited about the possibilities. "Let's just say it's safe and super awesome," Heikenfeld said. "There are a lot of great things coming up." It won't be long before wearable tech becomes the norm in the medical industry. Hospitals and clinics are already using wearable devices to collect patient data for faster decision making and diagnosis. The market for wearable sensors is just going to grow further from this stage. However, it is also necessary to ensure security and privacy of data collected. Wearable management solution can help in managing the associated risks of adopting wearable.